Icon of the Theotokos the Life-Giving Font. 17th c.
This article is about the feast day of the Life-Giving Spring. For the historic monastery see Church of the Life-Giving Font of the Theotokos (Istanbul). 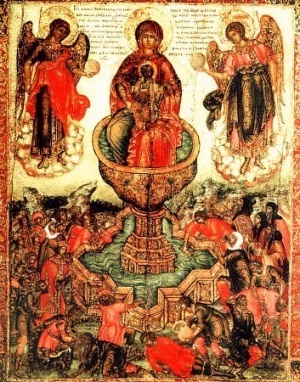 The Life-Giving Spring or Life-Giving Font of the Mother of God (Greek: Ζωοδόχος Πηγή; Russian: Живоносный Источник) is a feast day in the Orthodox Church that is associated with a historic church just west of Constantinople in Valoukli, as well as an icon of the Theotokos. The feast day of the Life-Giving Spring is commemorated on Bright Friday of each year (the Friday following Pascha), being the only feast day which may be celebrated during Bright Week, while the commemoration of the Life-Giving Spring Icon of the Most Holy Theotokos is observed on April 4. 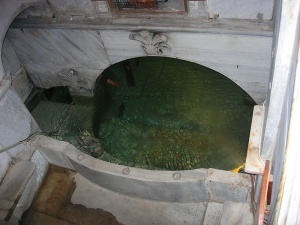 The Holy well (Hagiasma) of the Church of the Life Giving Font (Istanbul). 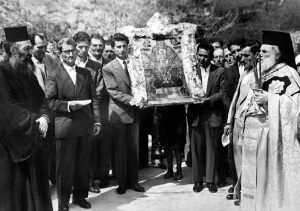 Procession on the feast day of the Life-giving Spring, Bright Friday 1959, Arcadia, Greece. There are two accounts extant concerning the revelation of the Life-Giving Font just outside the City of Constantinople. It is likely that in either case, before the 5th-6th century monastery was erected, a shrine was already in existence with a spring of water, near a grove of trees, and was dedicated to the Theotokos from early times. Over time, the grove had become overgrown and the spring became fetid. "Emperor Leo, go into the deepest part of the woods, and you will find water there. Take some of the cloudy water in your hands and give it to the blind man to drink. Then take the clay and put it on his eyes. Then you shall know who I am." The same voice added that she had chosen that very place to be worshiped and prophesied that he would one day receive the crown to the empire. Leo followed her order and at once the blind man recovered his eyesight. After his accession to the throne, the Emperor erected a magnificent church on this place, and the water continued to work miraculous cures. Therefore, it was called "The Life-Giving Spring." A second account is given by the prominent Byzantine scholar Procopius of Caesarea (flourishing ca.500-565). [note 1] In this version, the Emperor Justinian was out hunting when he came upon a small chapel in a beautiful wooded area, surrounded by a large crowd of people and a priest in front of a spring. Inquiring about this site, he was told that this was the “source of miracles”. He at once ordered that a magnificent church be built there, utilizing materials that had remained after the erection of the Hagia Sophia. The church was erected in the last years of his reign, ca.559-560, near the holy spring. [note 2] After the erection of the sanctuary, the Gate that was situated outside the walls of Theodosius II was named by the Byzantines Gate of the Spring (Greek: Πύλη τῆς Πηγῆς). Greek icon of the Theotokos the Life-giving Spring ("Panagia Argokiliotissa", Naxos). In one version of the icon that was found on Naxos island, Greece,[note 5] some differences are shown with respect to the ancient type. Around the cross-shaped basin stands the Emperor with his guard, while on the right is the Patriarch with his bishops. In the background, is represented Leo I with the blind man, and the walls of the City. Under the basin a paralytic and a madman are healed with the spring’s water. In Orthodox hymnography, the Theotokos is frequently compared with a Holy Fountain. The hymns and prayers of the feast are combined with the Paschal hymns, and there is often a Lesser Blessing of Waters performed after the Divine Liturgy on Bright Friday. In old Russia, continuing Greek traditions, there was a custom to sanctify springs that were located near churches, dedicate them to the Holy Mother, and paint icons of her under the title The Life Giving Spring. Rejoice, O thou Spring of life for all men. the ever-flowing waters of your grace from your perpetual Spring. ↑ The 11th century Byzantine historian George Cedrenus also mentions this version. ↑ In this context, "Holy Spring/Holy Font/Holy Source" becomes synonymous with the Greek: ἁγίασμα, hagiasma; Lit. : 'sanctuary'. ↑ This living water is contained in the Cross which must be born by all those who follow Him, just as He did. ↑ In the early Church, the baptismal font was actually in the form of a cross, just like the cross depicted in this icon. Christians would enter from the base of the cross and come out at the top, and then re-enter from the left of the cross and come out on the right of the cross; then the priest, who would be standing in the middle of the cross/baptismal font, would commune them. ↑ Icon of "Panagia Argokiliotissa", from Naxos island, Greece (Greek: Παναγία η Αργοκοιλιώτισσα - Νάξος). ↑ Archpriest Feodor S. Kovalchuk. Wonder-Working Icons of the Theotokos. Youngstown OH: Central Satates Deanery, 1985. pp.67–70. ↑ OCA - Feasts and Saints. Bright Friday. The Life Giving Spring of the Mother of God. ↑ Raymond Janin (in French). La Géographie ecclésiastique de l'Empire byzantin. 1. Part: Le Siège de Constantinople et le Patriarcat Oecuménique. 3rd Vol. : Les Églises et les Monastères. Paris: Institut Français d'Etudes Byzantines. 1953. p.232-37. ↑ Wolfgang Müller-Wiener (in German). Bildlexikon zur Topographie Istanbuls: Byzantion, Konstantinupolis, Istanbul bis zum Beginn d. 17 Jh.. Tübingen: Wasmuth, 1977. pp.416. ↑ Kristina Kondratieva (Global Art Communications project). Panagia The Life Giving Spring. Yuriy Kuznetsov: Icons of the XXI Century. Accessed: 2011-05-19. ↑ 6.0 6.1 Orthodox Metropolitanate of Hong Kong and Southeast Asia. Bright Friday. Accessed: 2011-09-28. Church of St. Mary of the Spring (Istanbul). The Miracle of The Veil in Constantinople 911 AD. Question 5. "What feast is celebrated Bright Friday? ", St Nicholas Russian Orthodox Church, Dallas Texas. This page was last edited on December 1, 2012, at 02:18. This page has been accessed 51,236 times.